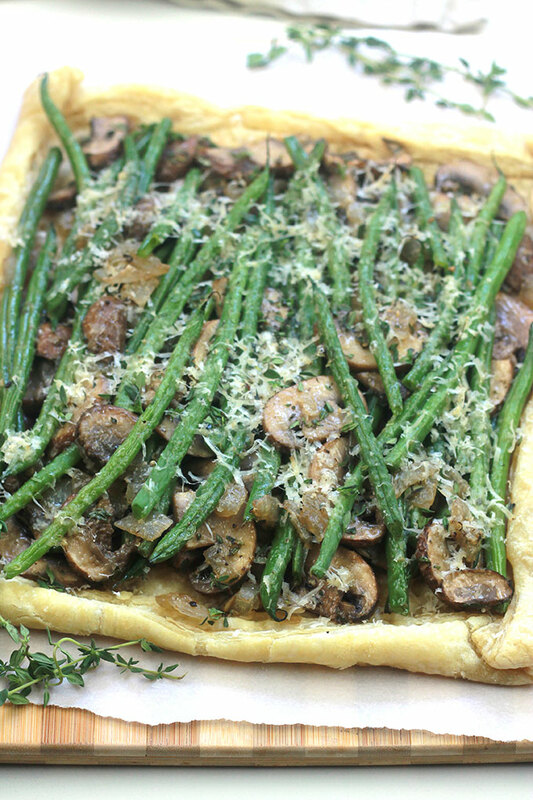 Rustic and savory Easy Mushroom Green Bean Tart. Great dish for a Black Friday brunch, perfect way to use Thanksgiving leftovers. Thanksgiving is an amazing holiday, sharing wonderful food with friends and family who gather from near and far. Then there is Black Friday shopping, which can be fun as well as a workout, leaving everyone ready for Thanksgiving leftovers. But instead of serving plain old leftovers I like to jazz them up a bit and Pepperidge Farm® Puff Pastry makes that easy. I started using Pepperidge Farm® Puff Pastry many years ago to make quick and easy appetizers and mini sweet tarts, but now I use it for so much more. I like to keep a box in my freezer for making things like herbed breadsticks, popovers, pizza, and hand pies. 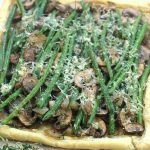 For our Black Friday brunch last year I used leftover green beans and Puff Pastry Sheets to make a delicious Easy Mushroom Green Bean Tart that was so quick and easy to put together, which is a requirement during the holidays. 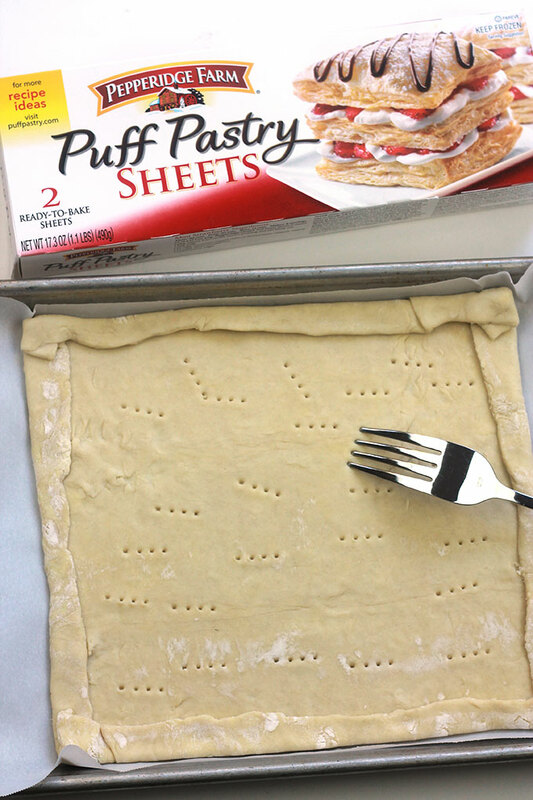 After rolling out a Puff Pastry Sheet, place it on a parchment lined baking pan and fold over the edges as seen below. Using a fork, poke hole in the bottom of the crust before baking. While the crust is baking, saute the onions and mushrooms over medium high heat. Toss in the green beans or you can use broccoli. 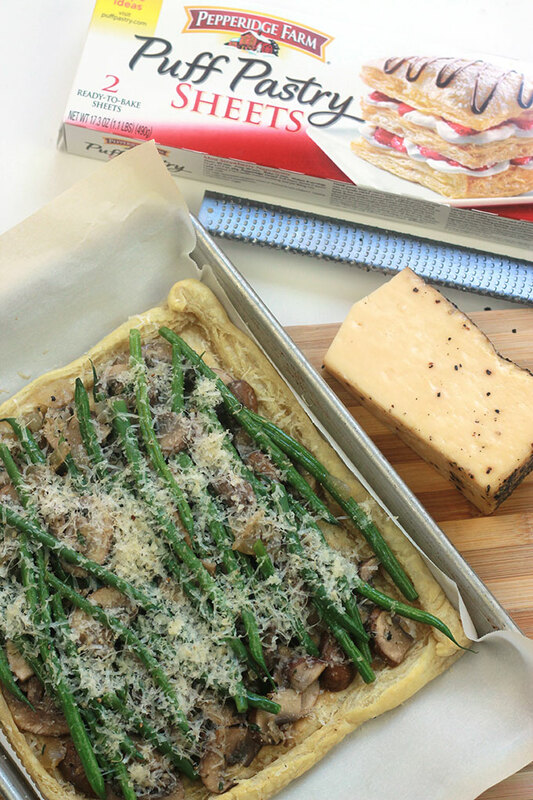 Arrange the mushrooms and green beans over the crust, top with cheese and bake in the oven once more until cheese starts to melt. I was lucky enough to find a peppered Romano cheese. When the cheese has melted, get ready to dig in and enjoy. 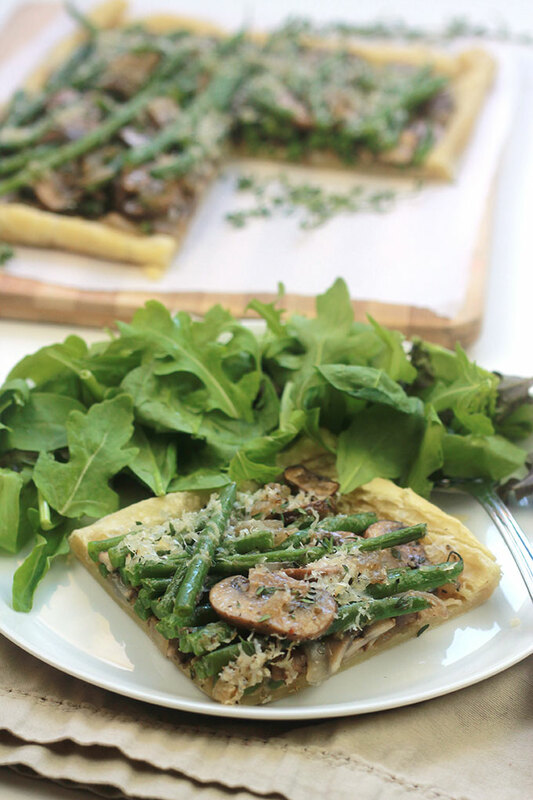 This Easy Mushroom Green Bean Tart is perfect with a side of salad. Using Pepperidge Farm® Puff Pastry Sheets helps to make holiday entertaining easy. Line a shallow 8.5 x 11.5 baking pan with parchment paper. Roll out the pastry sheet and place in the parchment lines baking pan, folding over the sides. Poke holes in the crust with a fork and brush with olive oil. Bake 10 to 12 minutes or until crust starts to brown. Remove from oven and reduce heat to 350. While crust is baking, saute onions until translucent, about one minute. 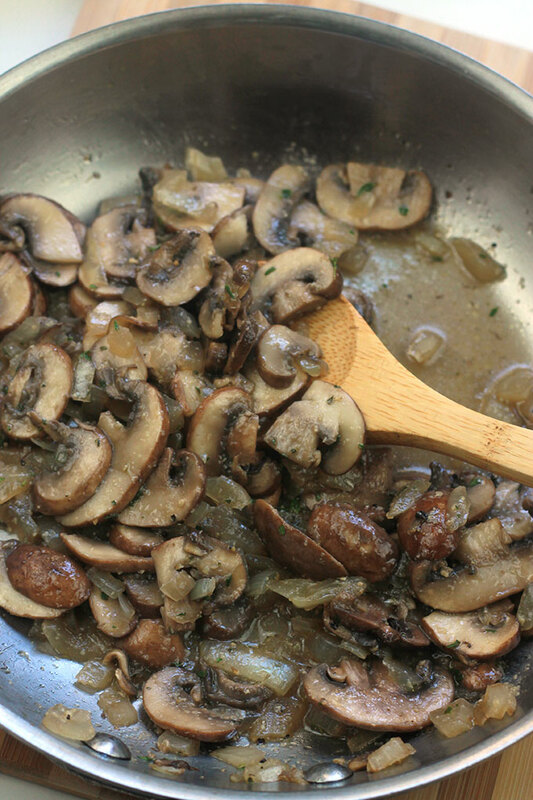 Add the mushrooms, garlic and thyme to the pan and continue to saute 2 to 3 minutes. Season to taste with salt and pepper. 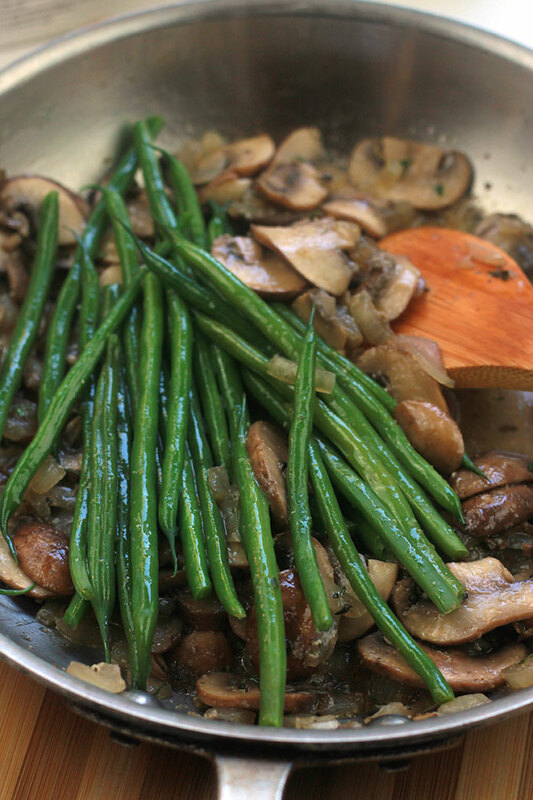 Remove pan from heat and toss the green beans with the mushrooms. Spread 3 tablespoons of cheese over the crust. Arrange mushrooms and green beans over the cheese, be sure to drain any liquid from mushroom mixture. Sprinkle the remaining cheese over the top of the mushrooms and green beans. Place in oven and heat until cheese starts to melt. When cheese has melted, remove from oven and sprinkle 2 teaspoons of thyme leaves over the tart. Allow to cool slightly, slice and serve with a salad. Black Friday brunch is now a tradition for my family and a great way to use those Thanksgiving leftovers. 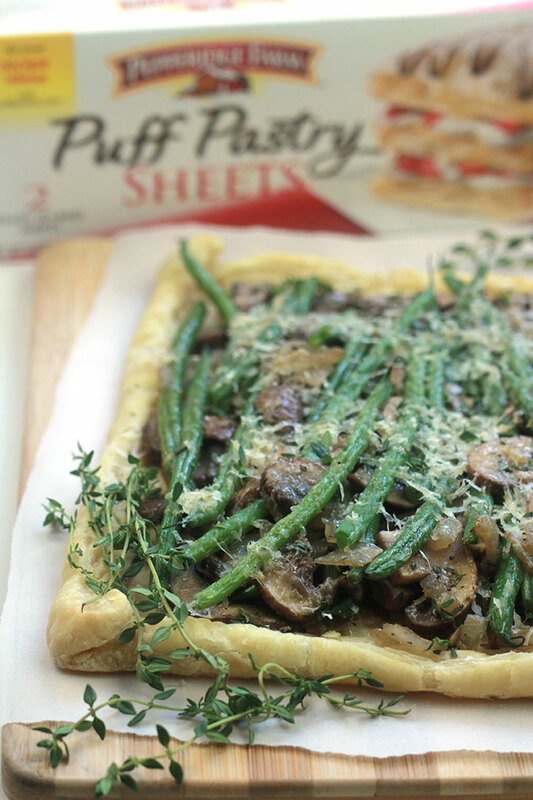 This Easy Mushroom Green Bean Tart is one of my favorites, I hope after giving it a try it will become one of your favorites. What are some ways you like to use Puff Pastry Sheets? For more great ideas visit the Pepperidge Farm® website, you may be surprised at the many creative ways to use Pepperidge Farm® Puff Pastry Sheets to help make holiday entertaining easier. 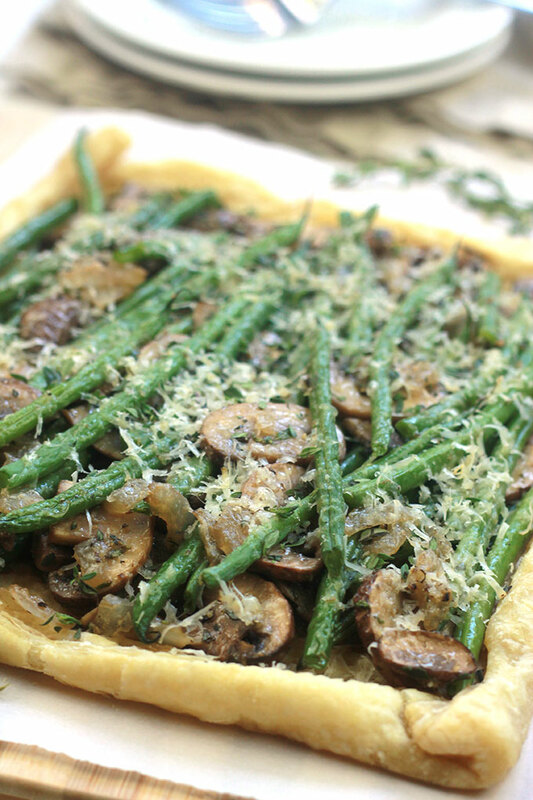 I can’t contain my enthusiasm for this delicious mushroom green bean tart. Pinned! Yum, this tart looks so delicious, Celeste! Thanks Sophie, I ate most of it all by myself, that good! Hey Celeste nice recipe you post here! I saw it the twitter also. 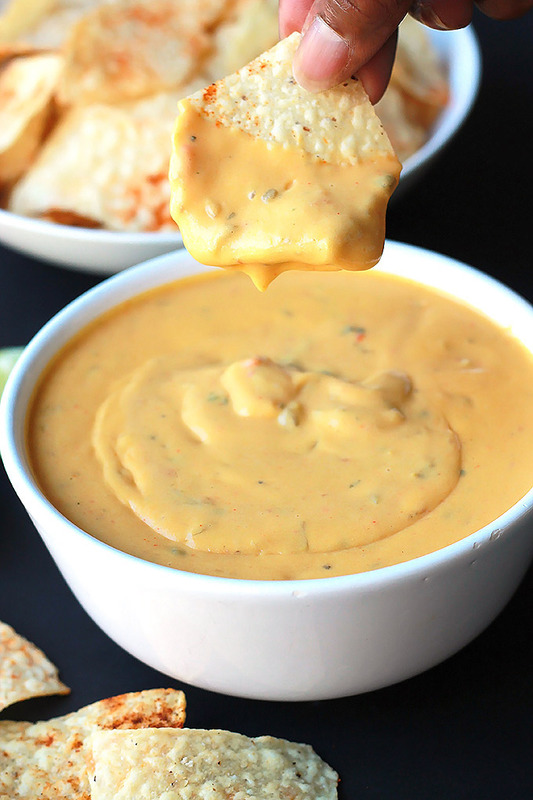 Color combination is too good & much healthy, cheese ingredient you used here. Very nice collection! What a great idea for a twist on the green bean casserole! Absolutely love your idea and I can’t wait to try it. Enjoy Susan, it is so delicious. Thanks for visiting. Thank you for sharing your wonderful post at #OverTheMoon. 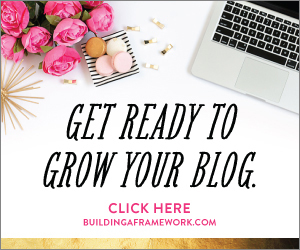 I look forward to what you will share next week! Do something special. Give yourself a standing ovation today! We hope you’ll come back again next Sunday when we open our doors at 6:00 PM EST. “Like” someone in person today! Thanks Marilyn, you are so kind. I enjoy sharing and finding awesome links at your “Over The Moon” party. This looks absolutely amazing! I love the idea of of a vegetable tart, especially around the holidays. Thanks Megan. I like it because it is so easy to put together and when you have a house full of family and friends it’s nice to have something that’s easy.